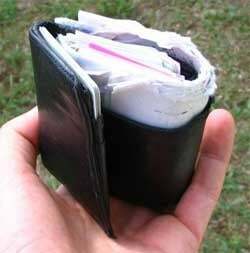 According to Mike Elgan, the wallet is an endangered species. That's because phones are primed to become upgraded, more secure, and more convenient versions of the standard wallet. He talks about things like the fact that credit cards are woefully inefficient in that they store a minuscule amount of data on a relatively bulky object and that the Near Field Communications systems already being put into place to handle credit cards as reasons that we may be saying goodbye to the wallet sooner than you might think. It all sounds pretty cool to me, as anything that can clean out my pockets even more is awesome.